This data set contains in-situ soil moisture profile and soil temperature data collected at 20-minute intervals at SoilSCAPE (Soil moisture Sensing Controller and oPtimal Estimator) project sites in four states (California, Arizona, Oklahoma, and Michigan) in the United States. SoilSCAPE used wireless sensor technology to acquire high temporal resolution soil moisture and temperature data at up to 12 sites over varying durations since August 2011. At its maximum, the network consisted of over 200 wireless sensor installations (nodes), with a range of 6 to 27 nodes per site. The soil moisture sensors (EC-5 and 5-TM from Decagon Devices) were installed at three to four depths, nominally at 5, 20, and 50 cm below the surface. Soil conditions (e.g., hard soil or rocks) may have limited sensor placement. Temperature sensors were installed at 5 cm depth at six of the sites. Data collection started in August 2011 and continues at eight sites through the present. The data enables estimation of local-scale soil moisture at high temporal resolution and validation of remote sensing estimates of soil moisture at regional (airborne, e.g. NASA's Airborne Microwave Observation of Subcanopy and Subsurface Mission - AirMOSS) and national (spaceborne, e.g. NASA's Soil Moisture Active Passive - SMAP) scales. This data set includes 249 files in NetCDF v4 (*.nc) format; 231 node-level 20-min soil moisture data files, 12 site-level files containing the daily average soil moisture, and six soil temperature data files. There are also companion files, consisting of 116 photos of the sensor nodes in the field, and ten maps providing soil and site characteristics for each SoilSCAPE site. Figure 1. 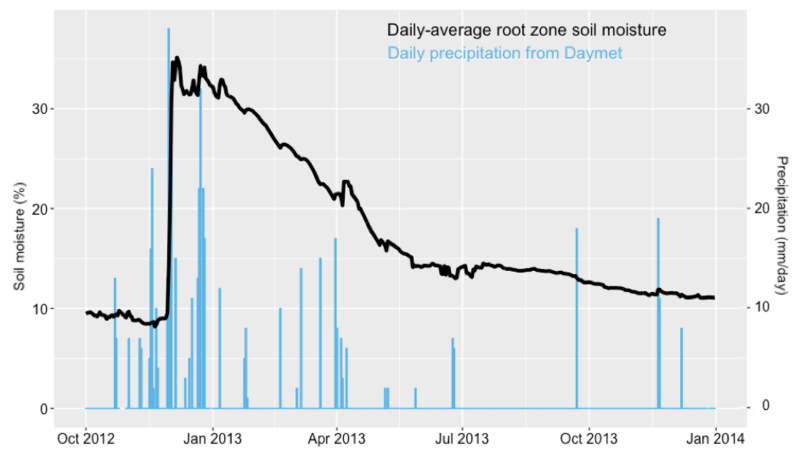 Site-average daily root zone soil moisture for Tonzi Ranch, CA site. Daily precipitation data is shown for comparison (from Daymet, 2016). This data set contains in-situ soil moisture profile and soil temperature data collected at 20-minute intervals at SoilSCAPE (Soil moisture Sensing Controller and oPtimal Estimator) project sites in four states (California, Arizona, Oklahoma, and Michigan) in the United States. SoilSCAPE used wireless sensor technology to acquire high temporal resolution soil moisture and temperature data at up to 13 sites over varying durations since August 2011. At its maximum, the network consisted of over 200 wireless sensor installations (nodes), with a range of 6 to 27 nodes per site. The soil moisture sensors (EC-5 and 5-TM from Decagon Devices) were installed at three to four depths, nominally at 5, 20, and 50 cm below the surface. Soil conditions (e.g., hard soil or rocks) may have limited sensor placement. Temperature sensors were installed at 5 cm depth at six of the sites. Data collection started in August 2011 and continues at eight sites through the present. The data enables estimation of local-scale soil moisture at high temporal resolution and validation of remote sensing estimates of soil moisture at regional (airborne, e.g. NASA's Airborne Microwave Observation of Subcanopy and Subsurface Mission - AirMOSS) and national (spaceborne, e.g. NASA's Soil Moisture Active Passive - SMAP) scales. The SoilSCAPE data can be used for validation of soil moisture estimates derived by the AirMOSS project. Access AirMOSS data at ORNL DAAC. Funding for the SoilSCAPE project came from NASA's Earth Science Technology Office, Advanced Information Systems Technology program. Temporal Coverage: The data covers the period 2011-08-03 to the present. Sampling is continuing at active sites, and data is updated weekly. Table 1. SoilSCAPE Sites. * Inactive sites. Figure 2. 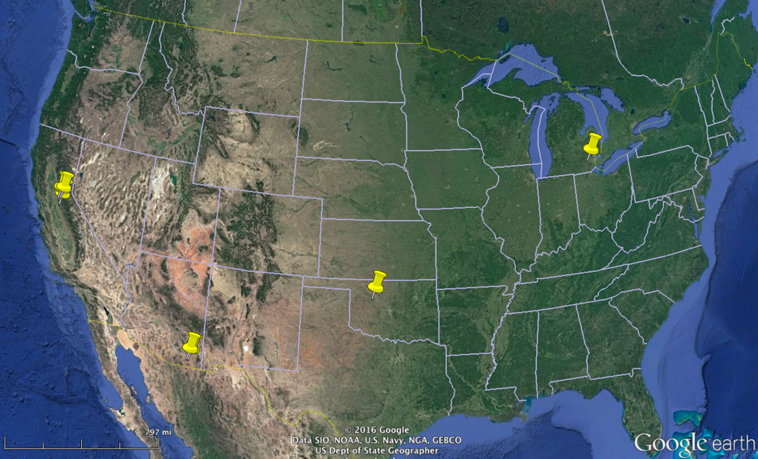 SoilSCAPE site locations. This data set includes 237 files in NetCDF format for 20-min interval data, 231 for soil moisture and 6 for soil temperature. There are 12 site-specific files for the daily averages of soil moisture. The locations of the sites are provided in Table 1. Volumetric soil moisture. Soil moisture values expressed as percentage volumetric water content. To convert to m^3/m^3 divide by 100. Soil moisture flag. For each sensor there is a numeric flag. The flags are intended to mirror the CEOP Data Flags used by the International Soil Moisture Network. 5 - (C) Exceeds field size (Negative SM values, fixed at 0.1 percent). Spikes are detected if |sm[i] - med(sm[i-1:i+1])| > 10 percent. Spikes are set to -9999.0 and flagged using flag 1. Soil moisture values less than 0.1 percent are fixed at 0.1 percent and flagged (5), negative values sometimes occur due to the current calibration. Values over 60 percent are flagged (5) and set to -9999.0. Type of the soil moisture sensor. This can be either Decagon’s ‘EC-5’ or ‘5TM’ sensor. ‘NA’ means sensor information is not available. Soil temperature. Soil temperature measured with a custom-made probe placed at 5 cm below the soil surface. Accuracy is +/- 0.5 degrees for temperatures in the range 5 - 30 degrees and +/- 1.5 degrees outside this range. Soil temperature flag. Soil temperature outside the range of -30 to 80 degrees C were flagged (5) and the soil temperature values set to -9999.0f. Daily average volumetric soil moisture for a node. Soil moisture values expressed as percentage volumetric water content, to convert to m^3/m^3 divide by 100. Soil moisture values with moisture flag values of 0 (Good) and 2 (Interpolated/Estimated) were used to compute the daily average. Companion files with this data set include 116 photos of the sensor nodes in the field (compressed within the “NodePhotos” directory), and ten *.pdf maps providing soil and site characteristics for each SoilSCAPE site. (1) Generation of local scale estimates of soil moisture at high temporal resolution. The point measurements from the sensor are scaled up to regional level hydrological models to produce local estimates of soil moisture. (2) Validation of remote sensing based estimates of soil moisture. Currently, the dataset is being used as part of validation dataset for two NASA missions – Airborne Microwave Observation of Subcanopy and Subsurface Mission (AirMOSS) and spaceborne Soil Moisture Active Passive (SMAP). For some sites in California, additional soil samples were collected to update the calibration (Table 6). These calibrations had RMSE of 1.5 % compared to the field-collected samples. Measurement spikes were removed by comparing to the immediately previous and following measurements for the node. The minimum soil moisture is fixed at 0.1 percent. The sensors with very noisy measurements (based on manual checking) were set to -9999.0. The flag values are included in the data file for each sensor. The soil moisture sensors (EC-5 and 5-TM from Decagon Devices) were installed at different depths (usually 3-4 depths up to 90 cm) below the soil surface. For newer installations, the sensors were placed at 5cm, 20cm and 50cm depths below the surface. However, when it was not possible to drill down deep enough due to hard soil and rocks, the sensors were installed as deep as possible (up to 30cm or 40cm depth). The sensor was held in place by fastening it to a t-post (Figure 3). A barbed wire fence was also installed around the sensor at some locations to prevent damage from cattle grazing. Figure 3. View of sensor node 401 at Tonzi Ranch, CA. 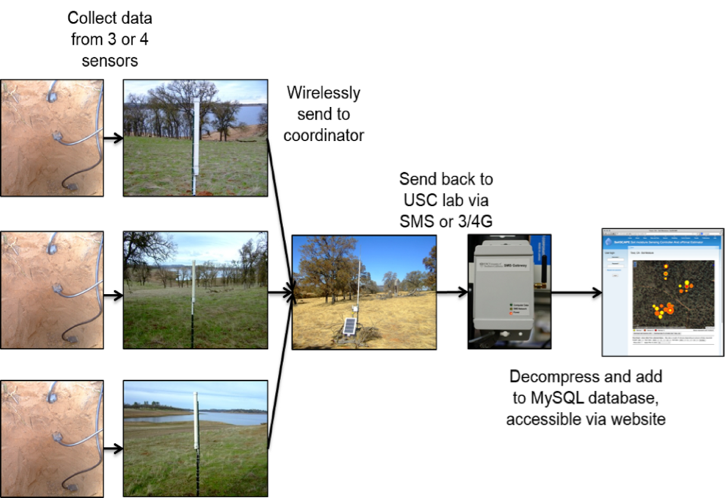 The sensors communicated with a local coordinator which wirelessly sent the data to the data server located at the University of Southern California (Figure 4). The optimal placement of the sensors in time and space is achieved using the steady-state soil moisture statistics and surface state distribution of soil moisture in the area of interest weighed against the cost of communication associated with the sensor placement. The system uses the wireless sensor architecture called Ripple (Silva et al., 2012), which has undergone a number of improvement over the years. The current iteration is Ripple 2D+. Figure 4. The wireless architecture of the SoilSCAPE network. Silva, A., M. Liu, and M. Moghaddam, Ripple-2 : A Non-Collaborative, Asynchronous, and Open Architecture for Highly-Scalable and Low Duty-Cycle WSNs. ACM MiSENET, August 2012, Istanbul, Turkey.